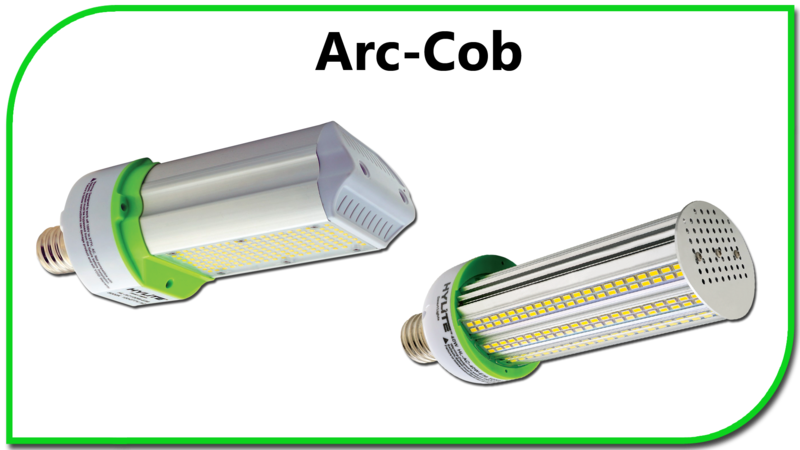 ARVA announces the release of its new generation of HyLite LED Arc-Cob Bulbs. The HyLite LED Arc-Cob Bulb features optimal optical performance with 180° light dispersion. It provides instant brightness with zero glares, hot spots, or shadows. With its patented and proprietary Integrated Heat Sink and Advanced Thermal Management System, the HyLite Arc-Cob bulb is designed to last up to 60,000 hours (17 years at an on-time of 10 hours/day) while maintaining more than 91% of its initial lumens through 60,000 hours. The HyLite LED Arc-Cob Bulb significantly reduces energy use, relamping & disposal costs, and environmental impact with an energy savings of up to 90%. It is suitable for fully enclosed fixtures and provides ultra-efficient illumination with up to 116 lm/w, the highest luminous efficacy in its class. A solid-state design with sturdy aircraft-grade aluminum housing, flame-retardant base, and a shatterproof lens allows the HyLite LED Arc-Cob Bulb to be used in applications with harsh environments and extreme temperatures ranging from -22°F to +140°F [-30°C to +60°C], and in High Shock and Vibration areas. The HyLite LED Arc-Cob Bulb is quick and easy to install in existing fixtures with its universal burning position design, compact size, and with universal power (120-277V). It is available in a complete range: 20W, 30W, 40W and 50W, for use in a wide variety of applications. The HyLite LED Arc-Cob Bulb does not contain any lead, mercury, heavy metals, or toxic gases, and is RoHS Compliant, CE approved, and UL Listed for safety. The HyLite LED Arc-Cob Bulb is also available for voltages of 347-480V and in DC Voltages for ideal use with Renewable Energy Resources such as Solar and Wind Power. For specification sheets and more information, please visit the HyLite LED Arc-Cob page here.